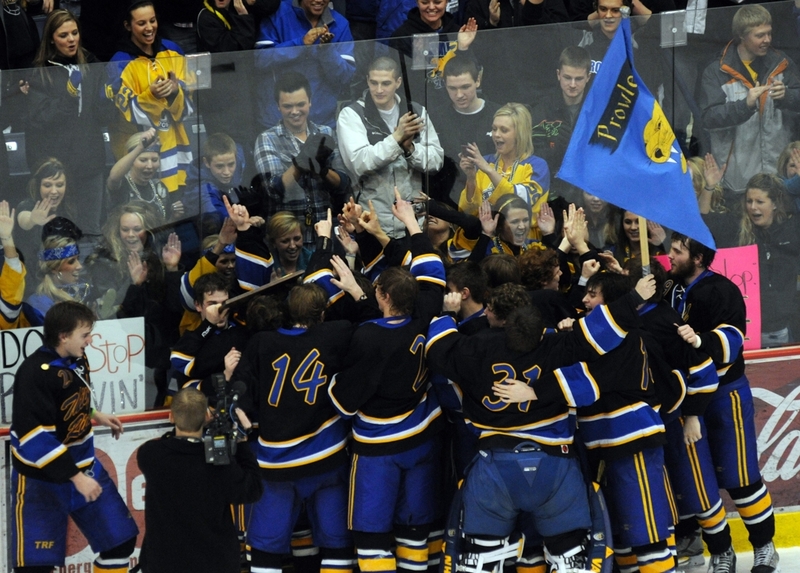 Thief River Falls players and fans joyfully celebrated the team's Section 8A championship -- and return to the state tournament (Photo by Tim Kolehmainen). If there hadn’t been school the next morning, the celebration might have gone on all night. After breaking a decade-long submission hold by Warroad in the Section 8A final Thursday night at Ralph Engelstad Arena, Thief River Falls was in a mood to party. The Prowlers were going back to state. Attendance numbers weren’t available, but there didn’t appear an empty seat in the house at the puck drop. Standing room only was the norm. Fans lined the concourse around the lower bowl, some clad in yellow Prowlers jerseys, some with spiked blue wigs and flashing LED sunglasses, some dressed a bit more conservatively. Officially, the Prowlers were the road team and wore their road blacks, but with the game on their home rink, most of the cheers were for the hometown team. The volume cranked up even higher as the Prowlers got on the board just 47 seconds into the game when Riley Soderstrom popped in a rebound. 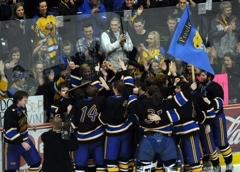 The cheers carried on all night, as Thief River Falls led the whole way. As the final seconds counted down, fans stood and saluted the team with a wave of whatever blue and gold object they could find. They remained in their seats throughout the medal ceremony and lingered long into the night, cheering the players and coaches as they individually walked through the concourse. 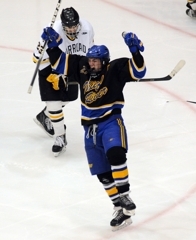 It’s difficult to fault Prowlers’ fans, past and current players, coaches, administrators and anyone with a Thief River Falls connection of their glee. Aside from one brief shining moment in 2006, the Warriors have dominated the playoff rivalry for the past decade. The two northwestern Minnesota combatants have met in the Section 8A tournament 10 years in a row, seven of those times in the final, including Thursday night. 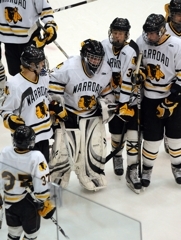 Heading into the latest meeting, Warroad had the definite edge, claiming eight of the first nine meetings. 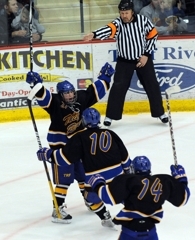 Thief River Falls’ only victory in that stretch was a four-overtime classic in the 2006 final, 3-2. “Seniors on the team have lost three straight years to them and we weren’t going to give our last year up,” said Ranum. Thursday’s victory for Thief River Falls was practically a blow out in terms of the playoff history between the two programs. That three-goal edge equaled the largest in the decade-year rivalry (Warroad 4, Thief River Falls 1 in the 2005 final) and also the highest goal total by any winning team. 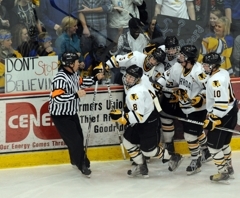 The average score of the 10 meetings doesn’t even equal four total goals (Warroad 2.4, Thief River Falls 1.1). It wasn’t just the fans who soaked up the night. Players prowled around the ice, each taking a turn kissing the section trophy. They took a few victory laps, then retired to the locker room to continue the celebration. But a few minutes later, the Prowlers popped back out on the ice to continue saluting the remaining fans. No one wanted the night to end. “It’s one of those things that they’ll remember for the rest of their lives,” said Bergland. Riley Soderstrom celebrates his goal 47 seconds into the first period (Photo by Tim Kolehmainen). 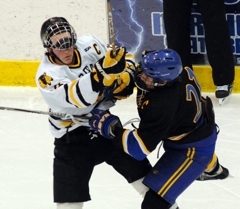 Thief River Falls' Matt Audette (3) got a penalty for head contact for this shot to Warroad's David Nelson (Photo by Tim Kolehmainen). 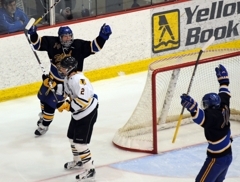 Wearing the road blacks on its own home rink, second-seeded Thief River Falls never trailed in beating top-seeded Warroad, 4-1, in the Section 8A final at Ralph Engelstad Arena Thursday night. Riley Soderstrom scored 47 seconds into the game on a rebound and the Prowlers (19-8-1) led the whole way. David Nelson scored early in the third period to cut the Prowlers' lead to 2-1 and the Warriors (19-9-0) put on plenty of pressure in the ensuing minutes, but Jon Narverud held them at bay. 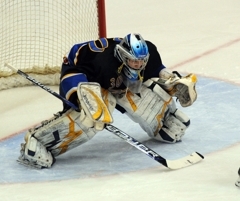 The Thief River Falls junior goaltender made 18 saves on 19 shots. 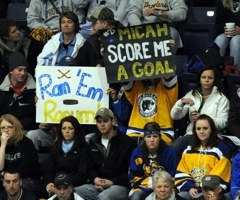 Micah Rarnum netted the game-winner three minutes into the second period, a goal that gave the the Prowlers a 2-0 lead. 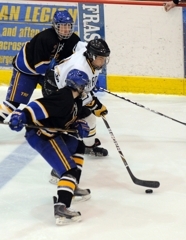 Connor Doherty and Brady Meunier also scored for Thief River Falls. Andy Foster made 20 saves on 23 shots for the Warriors. Soderstrom treated the full house, pro-Prowlers' crowd to a goal just 47 seconds into the game. 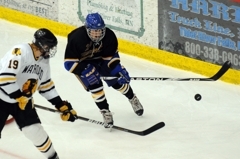 The junior forward corraled a rebound and fired it into the Warroad net to give Thief River Falls an early lead they did not relinquish. The senior was a playmaker all over the ice, setting up numerous scoring chances with his pinpoint passing and toughness along the boards. He netted just one assist, but could have had many more. 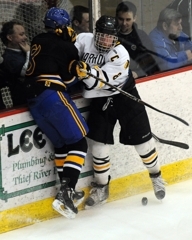 His physical play also countered Warroad's hard-hitting. Doherty was the right player in the right place at the right time. With Warroad cutting the Prowlers' lead to 2-1 and buzzing for more, Doherty found a loose puck on his stick and fired it home to regain a two-goal lead in the third. 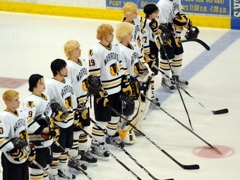 Warroad's moment was stopped and the Prowlers weren't again threatened. Eagles senior forward Jack Jensen registered three points, including a pair of goals, in his team's victory over the Red Knights. The Hawks' Joey Pierce, who notched an assist on the game-tying goal, netted the game-winner in overtime. After being sent to the penalty box in the first period, which led to a goal, the Sabres senior redeemed himself with the game-winner. Junior forward Teddy Lagerback netted a pair of second-period goals, guiding the Skippers past the Crimson. The Bears were down 2-1 after the first period, but erased the deficit and took the lead for good with a pair of power-play goals during the second period. John and Luke Mittelstadt combined for six points for the Eagles, who scored by committee. 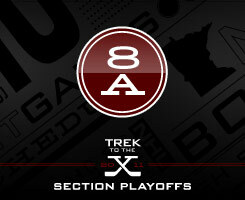 With the win, the Huskies defeated their Class 2A, Section 7 rival and maintained their perfect record. Tanner Mack tallied three goals in less than 5 minutes to spark the Green Wave offense. The Skippers opened their season and began their Class 2A title defense surrendering just one goal to the Cadets. Spencer Schneider scored twice for the Panthers to claim the first win of this year's The Opener tournament. Many matched or surpassed career marks of former Minnesota high school players currently on NHL rosters. An emerging team displaced old powerhouses from the top spot in our list. Check out our contenders in Class 1A and the potential finalists for the Mr. Hockey and Frank Brimsek awards. See which players made the 75th state tournament squads. See which photo you selected as your favorite from our coverage this season. The 5-9, 155-pound forward flashed his varsity bona fides on the ultimate of stages Saturday, scoring a goal in the third period and then adding an assist to help the Hornets rally past Eden Prairie. The Cadets won five Class 1A state championships since the Vannellis became co-head coaches in 2003. See who fans voted as the top performer from Jan. 21-26. Take it from the coach of champion St. Cloud Cathedral, who could sense the extra anticipation and emotion at Xcel Energy Center. 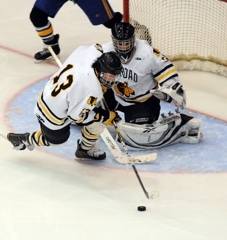 Unheralded Peter Colby scored his second goal of the game to give the top-seeded Hornets a 3-2 victory and the program's 13th hockey state championship. Click here to see this week's rankings. Mark Hvidsten's shot of Wheaton-Herman-Norcross' Emma Schmidt was voted the best photo from last season. 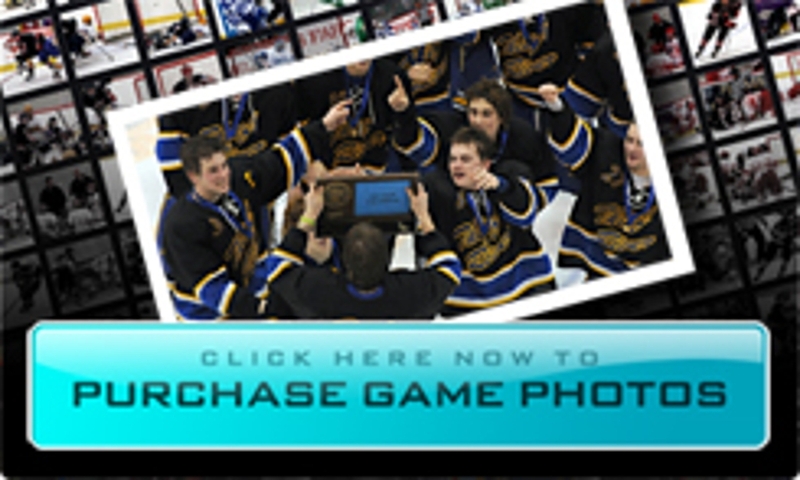 ©2019 MN Boys' Hockey Hub | High School Boys' Hockey News, Scores & Standings / SportsEngine. All Rights Reserved.